Issues related to diet and nutrition are becoming the number one global health challenge that we face today. Danone mission: to bring health through food to as many people as possible. Danone Nutricia Research is part of Groupe Danone and hence our mission is to bring health through food to as many people as possible. 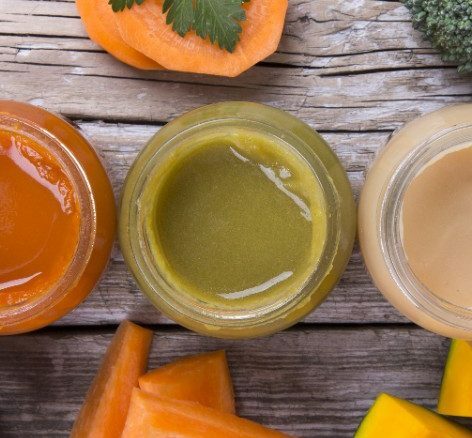 In support of this ambition, we aim to create nutritional solutions for a range of vulnerable groups, such as pregnant women, infants, children, and patients suffering from certain chronic diseases. Our research and development initiatives are guided by our six nutrition commitments. What we choose to eat and drink can affect the world in which we live. This is the idea that sits at the very heart of the Danone Alimentation Revolution. Danone, together with our consumers, retailers, farmers, suppliers and NGOs, is committed to designing, producing, marketing and consuming food in a new way – a way that brings health to people and health to our planet. Danone strongly believes in a food and water ecosystem that works in harmony with the environment. Danone want to make the Alimentation Revolution a reality for as many people as possible, all across the world because of the strong belief in a food and water ecosystem that works in harmony with people, communities and the environment. 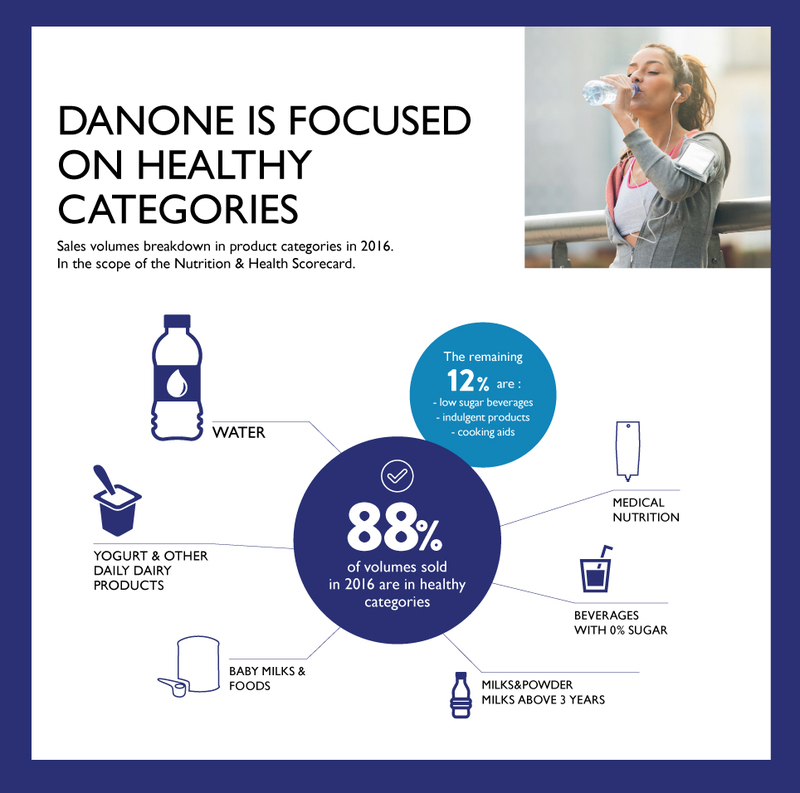 In 2016, 88% of Danone’s sales were from healthy categories. We have set nutritional targets for each of our products, based on official nutrient intake recommendations (e.g. WHO, EFSA, US, IOM) and on the latest scientific evidence, both external and in-house. We aim to meet these targets by 2020. We will design products that offer consumers healthier choices. We will achieve this through a combination of superior product experience and superior nutritional quality, compared with common alternatives. 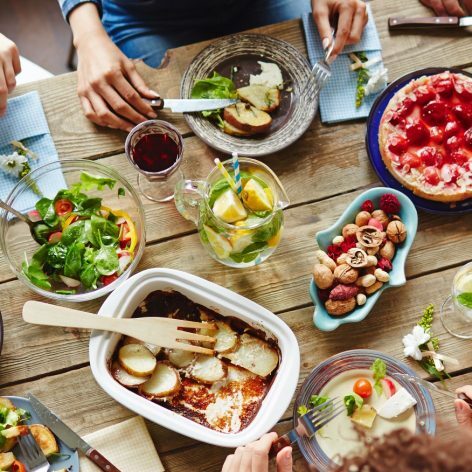 We will further our understanding of local eating and drinking patterns, practices and beliefs in order to have a greater influence when promoting healthier lifestyles. We have almost 150 education programmes in place, many developed in collaboration with academic and governmental partners. These healthy lifestyle initiatives reach over 500million people. Across all countries in which we operate, we have a strong business conduct policy. This includes support of the EU pledge for responsible marketing to children, as well as the WHO International Code of Marketing of Breast Milk Substitutes. All of our product labels are designed to guide healthier nutritional choices; we will continue to develop a policy for transparency in labeling of nutritional values. The work we carry out at Danone Nutricia Research is of central importance in bringing these commitments to life. We work hard each day to ensure the products we research and develop help meet Danone’s mission to bring health through food to as many people as possible. 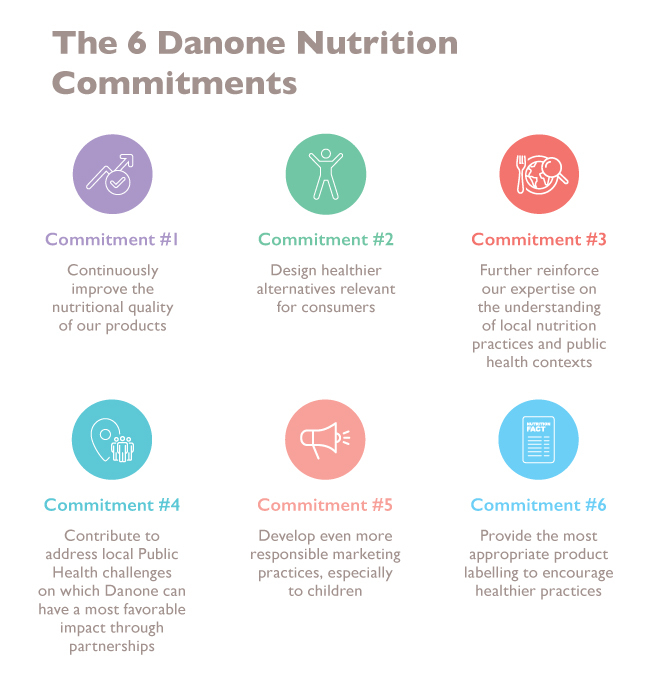 Learn more about the Danone Nutrition Commitments here. Learn more about Danone 2016 Nutrition Achievements here.